Today's nails are simple, since I've been cleaning and doing laundry allllllll day long. UGH. I hate cleaning, and what is worse than cleaning? Laundry. I used China Glaze Salsa as a base for the red nails and Sally Hansen Professional Lavender Cloud as a base for the ring finger. I stamped the design from BundleMonster plate BM19 with American Apparel Hassid for the black parts of the design, and China Glaze Salsa for the red heart on the ring finger. Topped everything off with 2 coats of Seche Vite top coat. Laundry is the worst. This is probably why there is a giant pile of it on my floor. Lol. Usually I put off doing laundry until I am practically without clothing to wear. I hate laundry too, it's such a bother. But I love this manicure, simple yet awesome. I love the colour variation you did too. 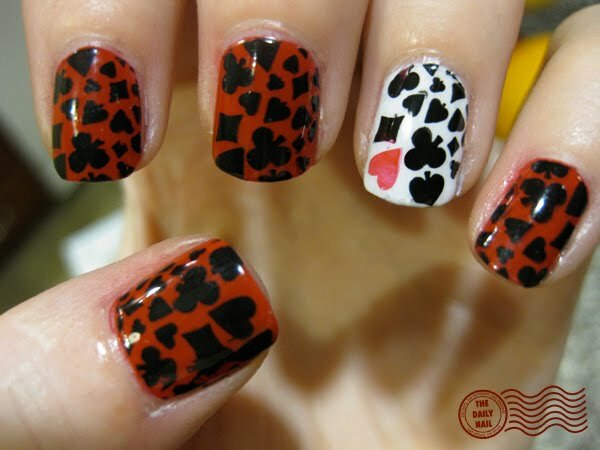 The accent nail takes this from OK to great!!! i love your blog, but i have a question...if you change your nail color every day, do you really need a top coat? let alone, two coats of top coat? especially since seche vite can get really pricey. just curious.. Cute! I love the different color & red heart on the ring finger. i love this one! how do you get the stamps? WORLD CUP NAILS! WORLD CUP NAILS! WORLD CUP NAILS! I actually think that laundty is the best part. I mean, if you have a washing machine, you just have to trow clothes inside and turn it on. LOL. What I really hate is cleaning bathrooms (AGH. Bacteria.) or washing the dishes. new subscriber here.. just want to say I love this blog idea. You're so creative!! I'll take laundry over cleaning anyday - the machine does the work for you! Nice mani.